NSSN 356: Watch VIDEO of NSSN TUC Rally – march & strike together for a pay rise! Last Sunday, up to 300 union activists, including TUC Congress delegates crammed into the National Shop Stewards Network Rally in Brighton, chaired by Janice Godrich PCS National President. They listened to Labour Shadow Chancellor John McDonnell and leaders of fighting unions as well as some of the main reps of the summer strike wave. So alongside Unite General Secretary Len McCluskey stood Unite strikers from the Birmingham Bins, BA Mixed Fleet and Barts NHS Trust disputes as well as the London Bus safety protest that took place today. And speaking with BFAWU leader Ronnie Draper was a McDonald’s striker. The main theme of the rally was the need for the public sector unions to fight together to defeat the Tory pay cap. Mark Serwotka from PCS called for co-ordinated strike ballots and said that “It’s now time for action.” The Congress passed the motion that called for joint strikes and a national demonstration against the pay freeze. The NSSN says that the unions now need to immediately come together to put this into action by arranging the balloting proves and name the date for a national demonstration. We believe such mobilisations would be massive and could link in with the long-running RMT strikes against Driver Only Operations which are spreading and the CWU ballot in Royal Mail that has now gone out to members. Both these struggles were outlined in our rally. During TUC Congress, the Tories have tried the tactic of divide and rule by appearing to break the pay cap for the police and prison officers. But the POA have already said it is not sufficient. All public sector workers deserve a pay rise above inflation, with extra funding so that it’s not paid for by job losses or attacks on terms and conditions. The message is clear from TUC Congress delegates this week, which we believe reflects the view of most public sector workers: it’s time to act – name the dates! 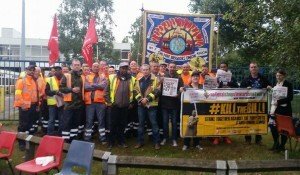 TUC condemns Birmingham council for reneging on Acas brokered bin strike deal (12 Sept) – The TUC Congress has today (Tuesday 12 September) unanimously supported a Unite emergency motion which condemns Birmingham council for reneging on an Acas-brokered settlement which would have ended the Birmingham bin strike. Having received the backing of the entire labour movement, Unite has announced that it will be holding a rally in support of the bin workers this Sunday (17 September). The rally will take place in Victoria Square, Birmingham. People attending the rally are asked to assemble from 11:00am and speeches will begin at 12:00 noon. Speakers will include Len McCluskey, general secretary of Unite.